Your identical objects need to share the same mesh and the same material. You can, however, add per-instance data; see Adding per-instance data, below, for more information. 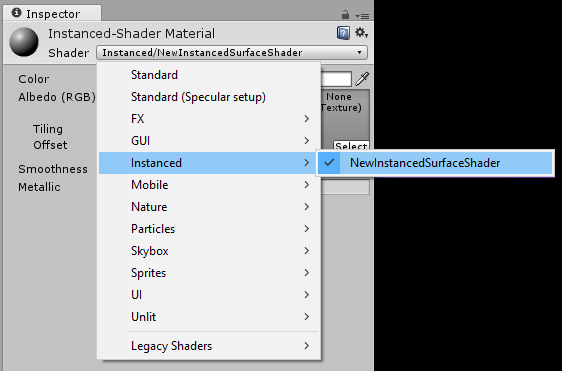 There is a Standard Surface Shader available that supports instancing. 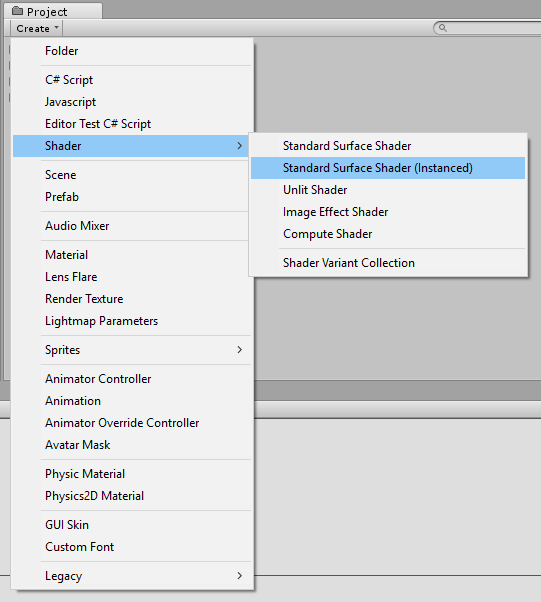 Add one to your project by selecting Shader > Standard Surface Shader (Instanced). UNITY_DEFINE_INSTANCED_PROP(float4, color) This defines a per-instance shader property with a type and a name. In this example the color property is unique. UNITY_TRANSFER_INSTANCE_ID(v, o); This copies the instance ID from the input structure to the output structure in the vertex shader. This is only necessary if you need to access per-instance data in fragment shader. UNITY_ACCESS_INSTANCED_PROP(color) This accesses a per-instance shader property. It uses instance ID to index into instance data array. Note: As long as material properties are instanced, renderers can always be rendered instanced, even if you put different instanced properties into different renderers. Normal “non-instanced” properties cannot be batched, so do not put them in the MaterialPropertyBlock; instead, create different materials for them. In instanced shaders, UNITY_MATRIX_MVP (among other built-in matrices) is transparently modified to include an extra matrix multiply. Specifically, it is expanded to mul(UNITY_MATRIX_VP, unity_ObjectToWorld). unity_ObjectToWorld is expanded to unity_ObjectToWorldArray[unity_InstanceID]). UnityObjectToClipPos is optimized to perform 2 matrix-vector multiplications simultaneously, and is therefore more efficient than performing the multiplication manually as the shader compiler will not automatically perform this optimization. You don’t have to define per-instance properties, but setting up an instance ID is mandatory, as world matrices need it to work correctly. If you have more than 2 passes for multi-pass shaders, only the first passes can be instanced. This is because Unity forces the later passes to be rendered together for each object. You need to tell Unity to always calculate the vertex transformation. To do this, multiply by M first, then by VP (VP * M * v) in add passes. This allows you to avoid conflict in the base/first passes caused by small floating point error. Define UNITY_USE_CONCATENATED_MATRICES before including UnityCG.cginc. You don’t need to do this for surface shaders, as it is automatically generated. D3D constant buffers have a maximum size of 64KB. For OpenGL, it’s usually 16KB. You will reach this limit if you try to define too many per-instance properties. The shaders may fail to compile or, even worse, the shader compiler might crash. To work around this, you have to balance between the size of the batch and the size of per-instance properties. Defining UNITY_MAX_INSTANCE_COUNT with an integer before including any .cginc file allows you to limit the maximum number of instances an instanced draw call can draw. This allows for more properties per instance in the instance constant buffer. You can achieve the same result when using a surface shader with #pragma instancing_options maxcount:number. The default value of this max instance count is 500; for OpenGL, the actual value is one quarter of the value you specify - so 125 by default. All the shader macros used in the above example are defined in UnityInstancing.cginc. You can find this file in [Unity folder]\Editor\Data\CGIncludes.